Danger can be found anywhere, in a mangrove swamp or on a highway during a snowstorm. 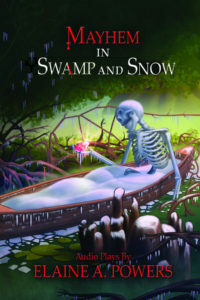 This collection, Mayhem in Swamp and Snow, contains two full-length mystery-themed audio theater scripts. The scripts require multiple actors and are well-suited for presentation by school and community theaters. "In The Swamp" takes place in a south Florida mangrove swamp where skeletons are found. Scientists help the forensic pathologist discover how the victims were killed. In "Ruby Snowstorm," a woman is found murdered in her car while stranded on Interstate 78 during a snowstorm. Amateur sleuths find answers to her demise in the world of jewelry. Performance rights are included with script purchase.